Delta is on a road show to raise US$220m to fund its new African venture. The plan is to reverse list a mixed portfolio of properties into AltX-listed Osiris Properties International, which has its primary listing on the Bermuda Stock Exchange. Osiris recently changed its name to Delta International Property. Nomvete says the company under its new guise will move to the JSE's main board once the capital raising and agreements to acquire the first tranche of properties are concluded. Nomvete expects that to happen in the first week of June. The fund will offer an initial income yield of 8% (in dollars). "We are primarily an income company so we are looking to buy only completed property assets." Delta International's flagship property will be the 30,000m² Anfa Place shopping centre in Casablanca, the second-largest mall in Morocco. "We like the centre because it has a European flavour. It's anchored by French supermarket Carrefour. Other tenants include UK-based Marks & Spencer," he says. The initial portfolio will also include two large office buildings in Maputo that house the Mozambique head office of Vodacom and insurer Hollard. Nomvete says Delta has identified a further pipeline of deals worth US$550m in a number of other African countries. He concedes that the African (excluding SA) real estate market has become very competitive. But he is confident that Delta International Property's management team, under retail property veteran Paul Simpson, has the knowledge and expertise to grow the fund's assets to at least US$1bn within the next two to three years. Nomvete has built a reputation for delivering on his growth promises. 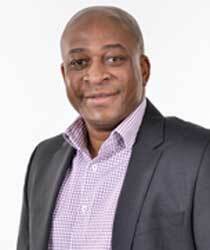 When Delta Property Fund, which is involved in merger talks with fellow black-managed Rebosis Property Fund and Ascension Properties, was listed in November 2012, Nomvete's pre-listing target was to grow the mostly government-tenanted office portfolio from R2,1bn to R7bn within five years. That target was reached within 15 months. Analysts welcome the advent of more specialist property counters on the JSE. "We find fundamentals and opportunities in the rest of the African continent interesting and would love to see more funds with an African focus," says Keillen Ndlovu, head of listed property at Stanlib. Other property stocks that offer investors exposure to African countries besides SA, albeit only a small part of their overall portfolios, include Hyprop Investments, Attacq, Resilient Property Income Fund and Rockcastle.